ISBN 9790006536412. 30 x 23 cm inches. Text Language: English. Illustrations: Charlotte Panowsky. 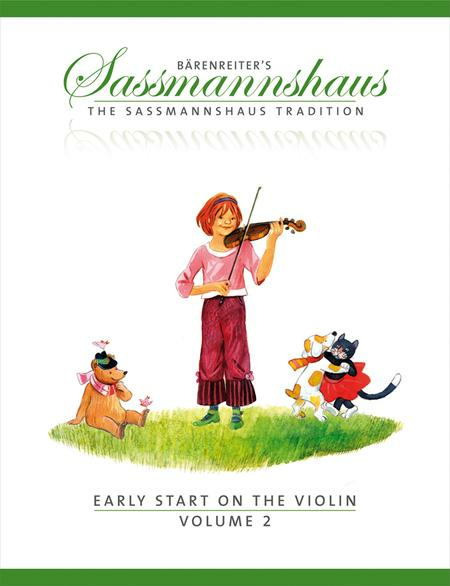 Original German title: Fruher Anfang auf der Geige - Band 2; Eine Violinschule fur Kinder. The second volume already presents classical violin duets. The child's knowledge and technique is expanded by dotted rhythms, sixteenths notes, and first double stops. And here is the most revolutionary aspect of the method: different finger more...patterns can be connected and combined to create any major and minor scale without the use of open strings. This creates the ability to practice scales in any position, often within the first year of playing! With this skill, songs learned in first position are easily transposed to other keys and higher position. Coupled with beginning shifting exercises this sets a foundation for an early virtuoso technique not available in any other method. The product was protected by a hard card board and plastic! This series is the best on the market for starting any age. It does not intimidate anyone and keeps the student with a pleasant attitude toward learning. My daughter has been playing for 3 years, but just started learning how to read music in the last couple of months. The pieces in this book are short and wonderful, with the added bonus of being duets, which adds to the fun. I would highly recommend this book. 29 of 57 people found this review helpful. Good for young violin beginners. My daughter is 6 and had been playing for almost a year. This book is just enough of a challenge for her. 40 of 90 people found this review helpful.